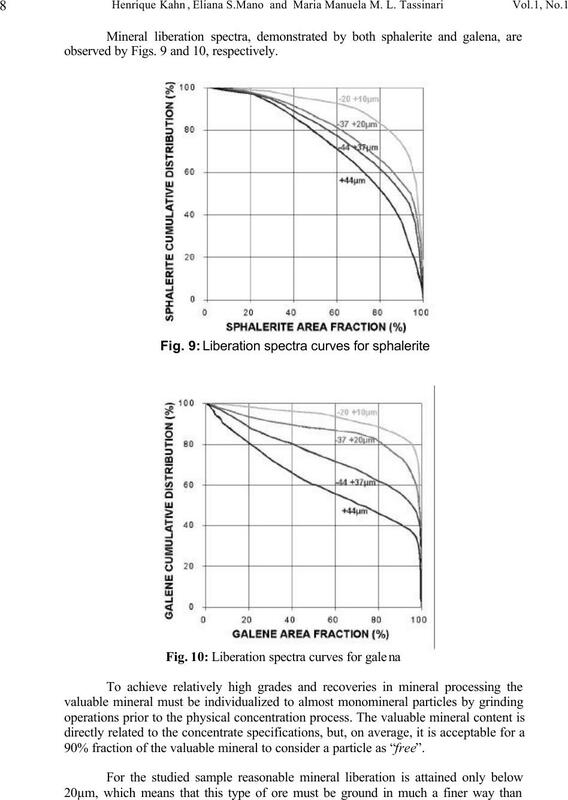 quantification and for the assessment of the degree of mineral liberation. these analyses resulting in more reliable and rapid outcomes (1, 2, 3). that could be used to differentiate them. dispersive spectrometry (EDS) were considered for this purpose. system which operates under the same SEM PC hardware. 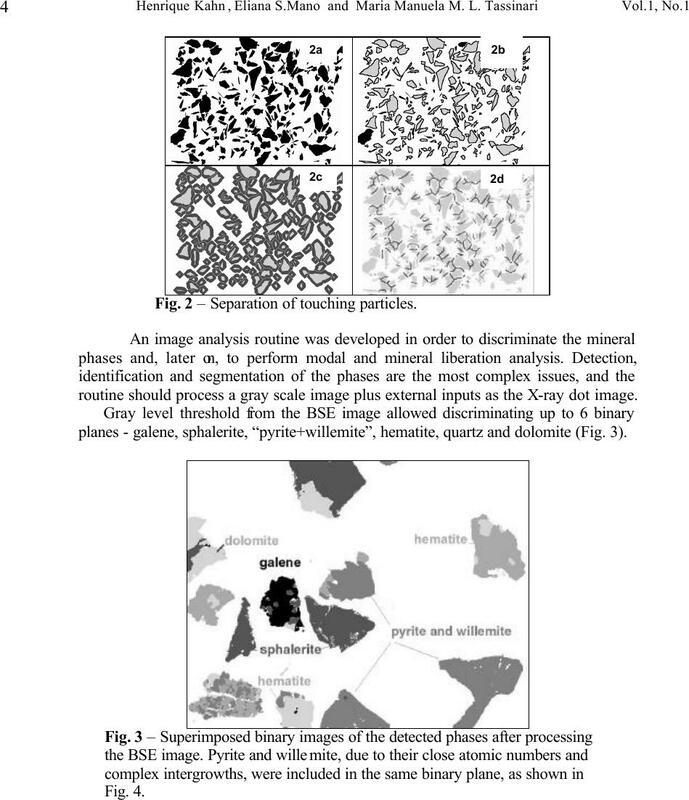 occur as trace minerals (<1%) and were not discriminated by image analysis (others). a thin-polished section presenting the major mineral phases. 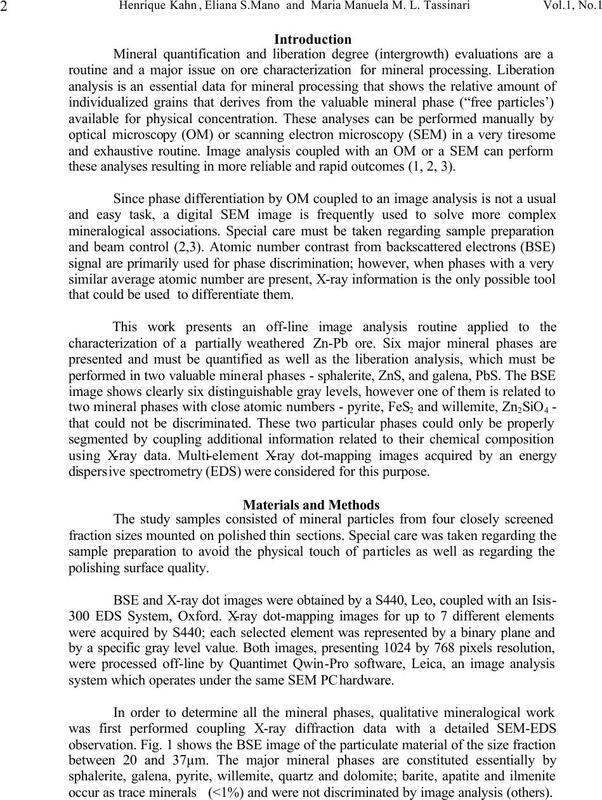 acquisition of BSE and X-ray images with a good quality for further processing. first step in image processing is to individualize these touching particles. logical operation, resulting in the final binary image of particles to be measured. Fig. 2 – Separation of touching particles. 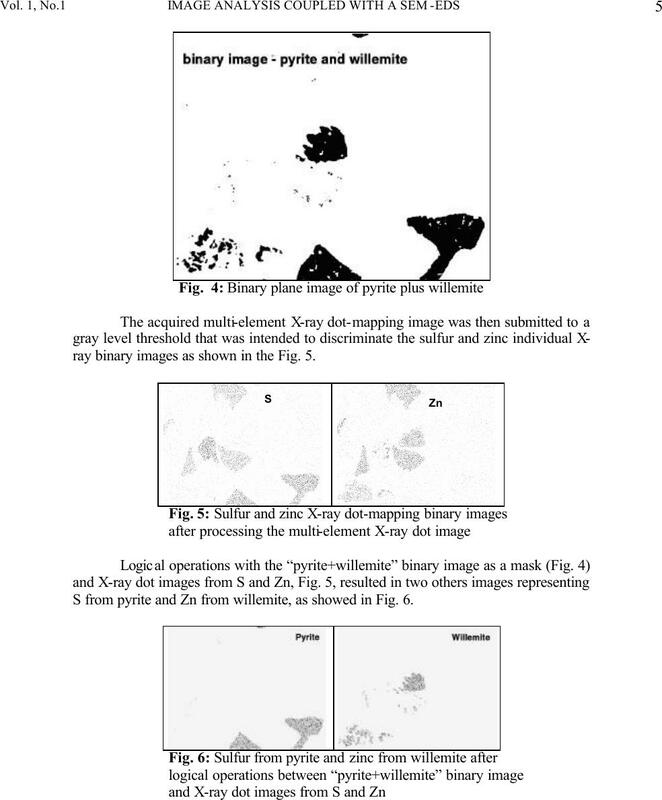 routine should process a gray scale image plus external inputs as the X-ray dot image. planes - galene, sphalerite, “pyrite+willemite”, hematite, quartz and dolomite (Fig. 3). ray binary images as shown in the Fig. 5. 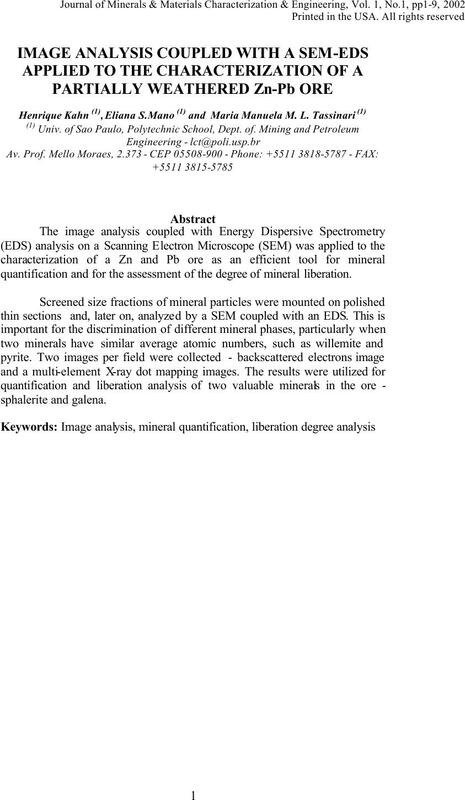 S from pyrite and Zn from willemite, as showed in Fig. 6.
two phases, as observed in Fig. 7.
attained considering the mineral densities and their volume fractions. mineral phase (liberation spectra or potential recovery curves). were not applied to the attained results. The methodology above was applied to four closely screened size fractions. exposed in Fig. 8 and by the results presented in Table 1.
elements. 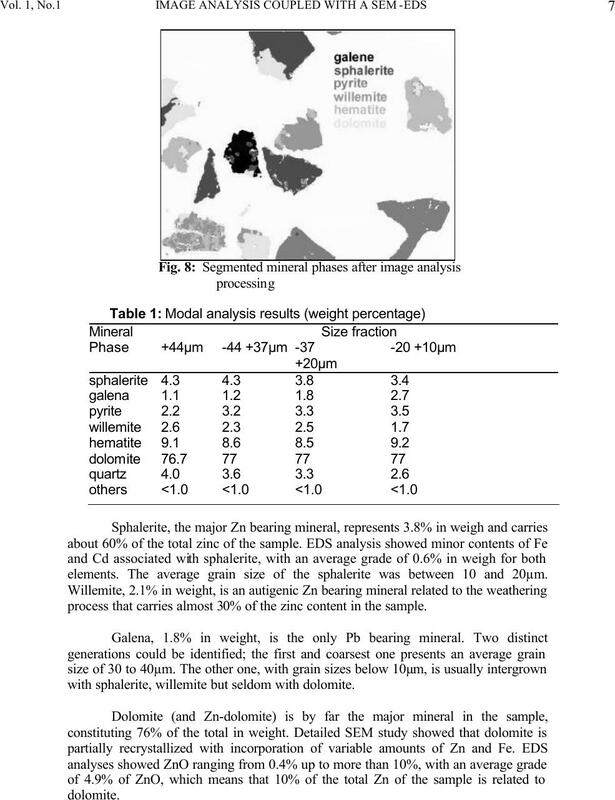 The average grain size of the sphalerite was between 10 and 20µm. 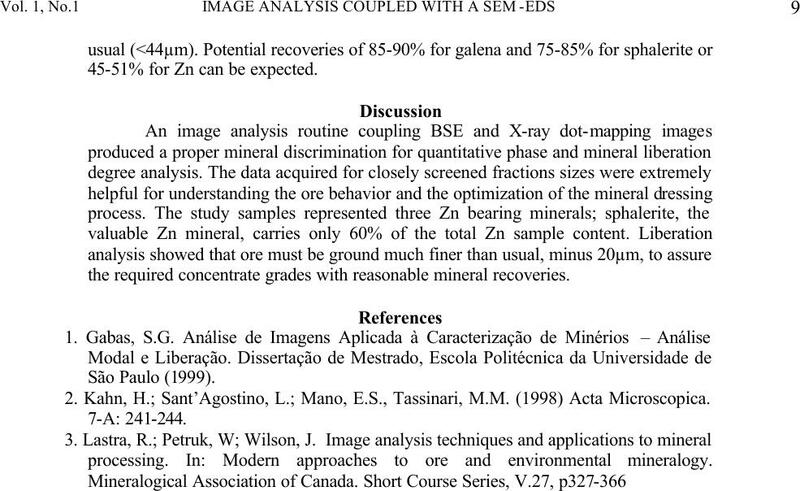 process that carries almost 30% of the zinc content in the sample. with sphalerite, willemite but seldom with dolomite. observed by Figs. 9 and 10, respectively. 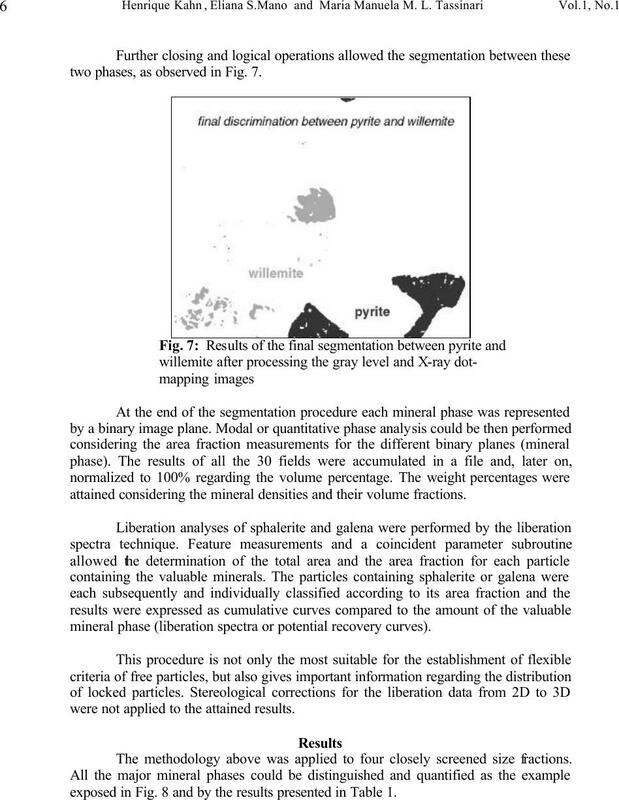 90% fraction of the valuable mineral to consider a particle as “free”. 45-51% for Zn can be expected. the required concentrate grades with reasonable mineral recoveries. 2. Kahn, H.; Sant’Agostino, L.; Mano, E.S., Tassinari, M.M. 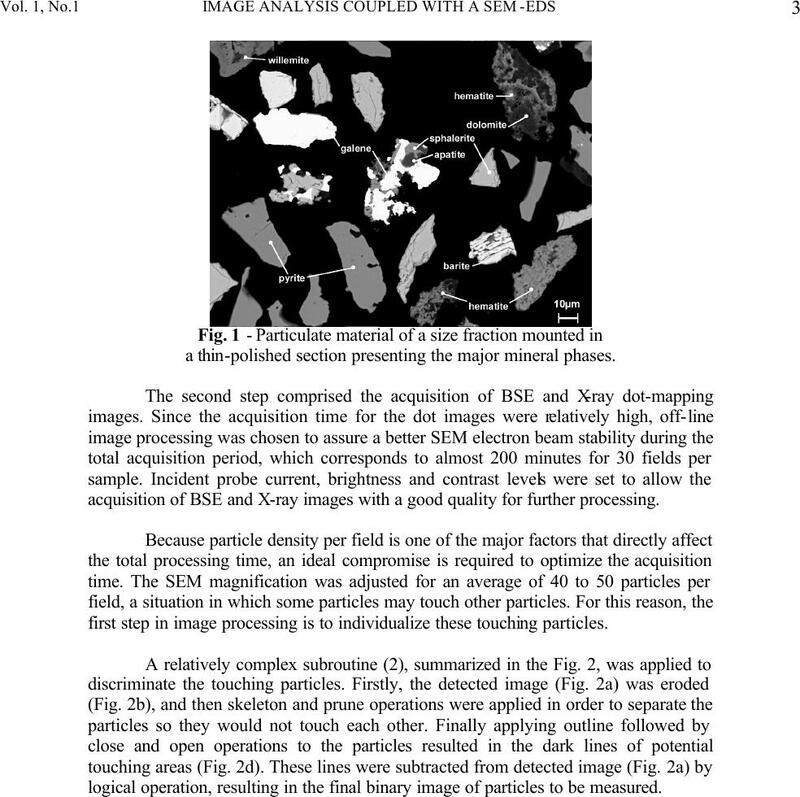 (1998) Acta Microscopica. processing. In: Modern approaches to ore and environmental mineralogy.